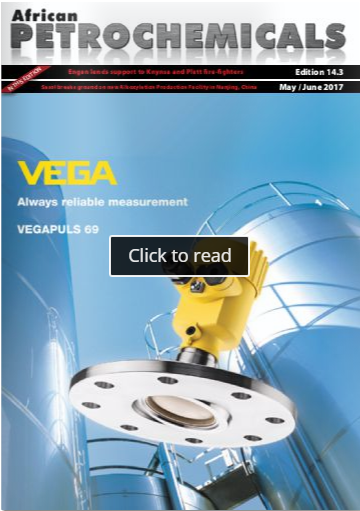 VEGA Grieshaber KG is now introducing VEGAPULS 64, the first radar level sensor on the market for liquids that measures at a frequency of 80 GHz. This feature allows considerably better focusing of the radar beam. The sensor provides high measurement certainty even in tight spaces, e.g. in pump shafts, or when there is heavy buildup and contamination. Until now, a radar sensor with a transmission frequency of 26 GHz and an 80 mm-diameter antenna had a beam angle of approximately 10°. With an antenna of the same size, VEGAPULS 64 has a beam angle of only 3°. Thus, the sensor can be used even in very narrow shafts where, for example, various pipes are installed. The radar beam just goes right past the obstacles. The larger the dynamic range of a radar sensor, the higher the measurement certainty and the wider the range of applications the sensor can be used for. Until now there was no radar sensor for liquid applications on the market with a dynamic range like that of VEGAPULS 64. This means that media with very poor reflective properties, i.e. with a low dielectric constant, can now be measured considerably better than with previous radar sensors. Due to its higher level of measurement certainty, VEGAPULS 64 measures reliably even in applications with foam, turbulent product surface, dirt and condensation. It has an accuracy of +/-2 mm, even when deployed in a measuring range of 30 m.
The new radar level sensor VEGAPULS 64 is well qualified for use in all areas of process automation. By virtue of the technical advantages of its 80-GHz technology, the sensor offers truly reliable level measurement for a wide variety of applications in the water and wastewater industry. Thanks to its small antenna – the diameter of the smallest version is no larger than a 1-euro coin – and the resulting compact process fittings, the sensor is an interesting alternative for cramped installation conditions.